Don’t you just love the elegance and sophistication of a white countertop? Kitchens and baths dressed in white are always in style, in part because they evoke cleanliness. Let’s be honest, kitchens and bathrooms take the brunt of the abuse in most households and durable, easy-to-clean surfaces are a must. Fortunately, quartz countertops can stand up to the use and clean up effortlessly. 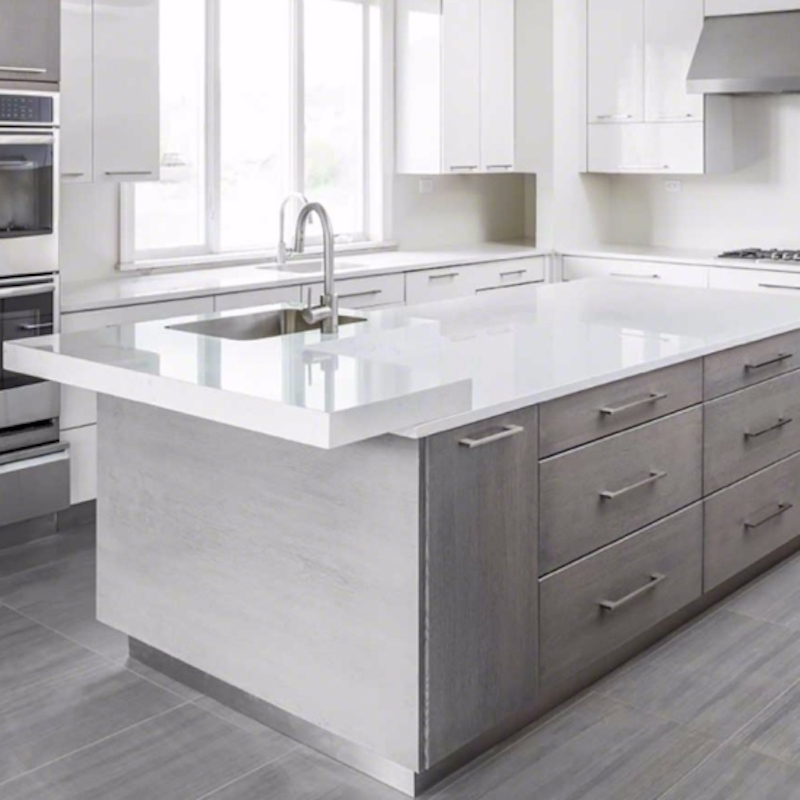 If you’ve considered quartz in the past, it is time to take a look at the new quartz countertop colors. Today, quartz counters are available in a wide range of colors and patterns—with many choices mimicking natural stone perfectly. 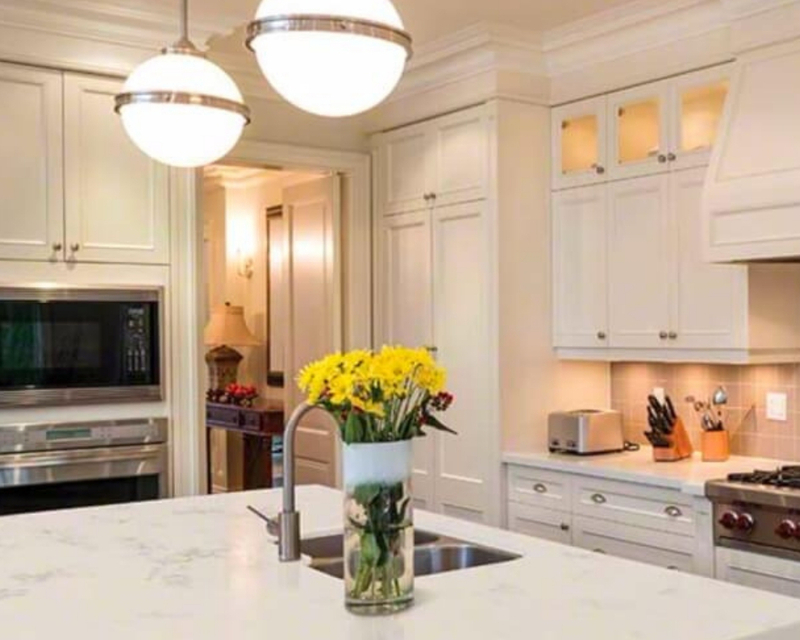 One of the hottest trends today is marble look quartz that gives you all of the grace, beauty, and full of life characteristics of natural marble in a durable surface that never needs sealing. Do you remember life before kitchen islands? It is hard to believe we survived without expansive islands where we can prep food, set a buffet, gather for cocktails, or have the kids do their homework. The kitchen may be the heart of the home, but the island is the heartbeat. The kitchen island is a great place to add a touch of color and pattern to a white kitchen. In this kitchen, the realistic marble-look quartz, Carrara Grigio from MSI’s Q Premium Natural Quartz™ collection blends the white cabinetry with the gray perimeter countertops. The look is clean and sophisticated. If you yearn for a more contemporary look, quartz countertops are an excellent option. This high-style gray and white kitchen combines gray floors and island cabinetry with the subtle pattern of our marble-look Cashmere Carrara quartz. 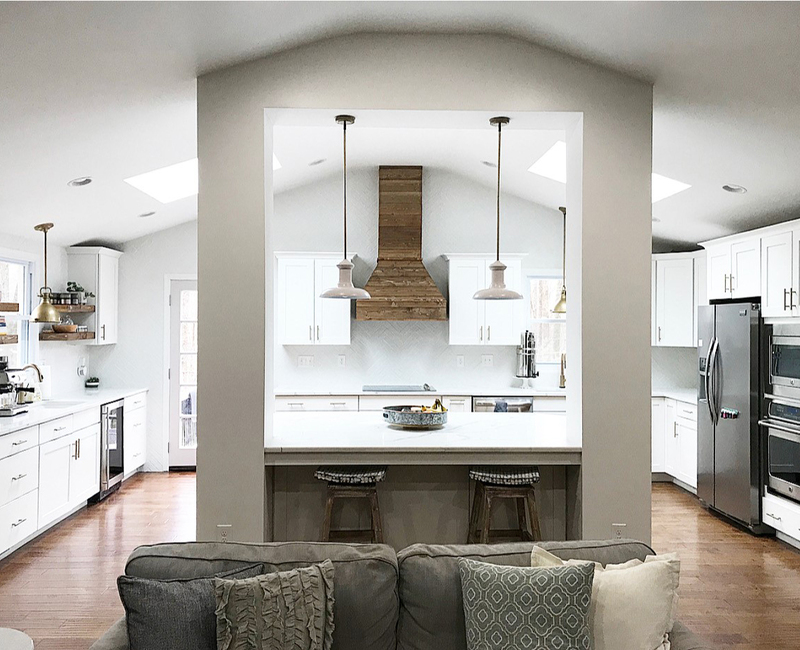 At first glance, the countertop looks pure white, complementing the surrounding cabinetry—but on closer inspection, the gray veins balance this sun-soaked kitchen’s restrained aesthetic quite naturally. 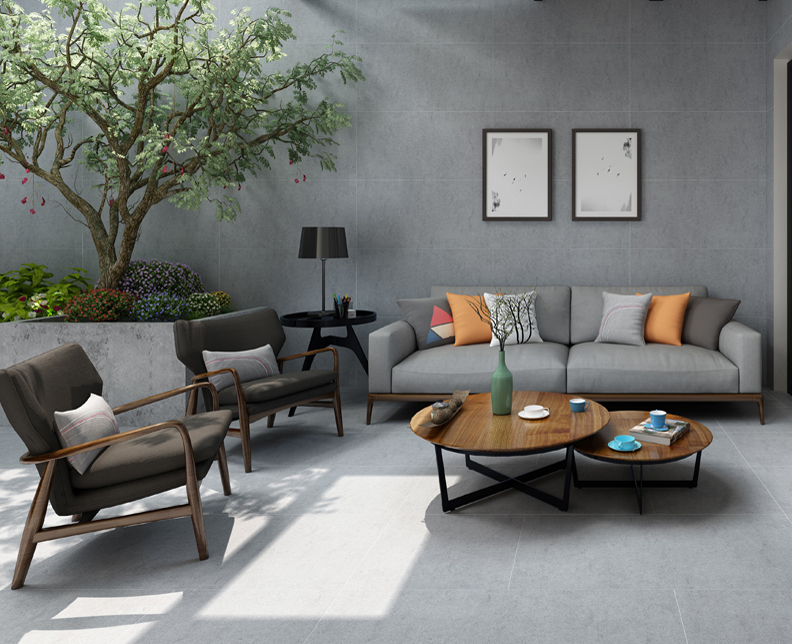 Gray, much like white, is always on-trend. 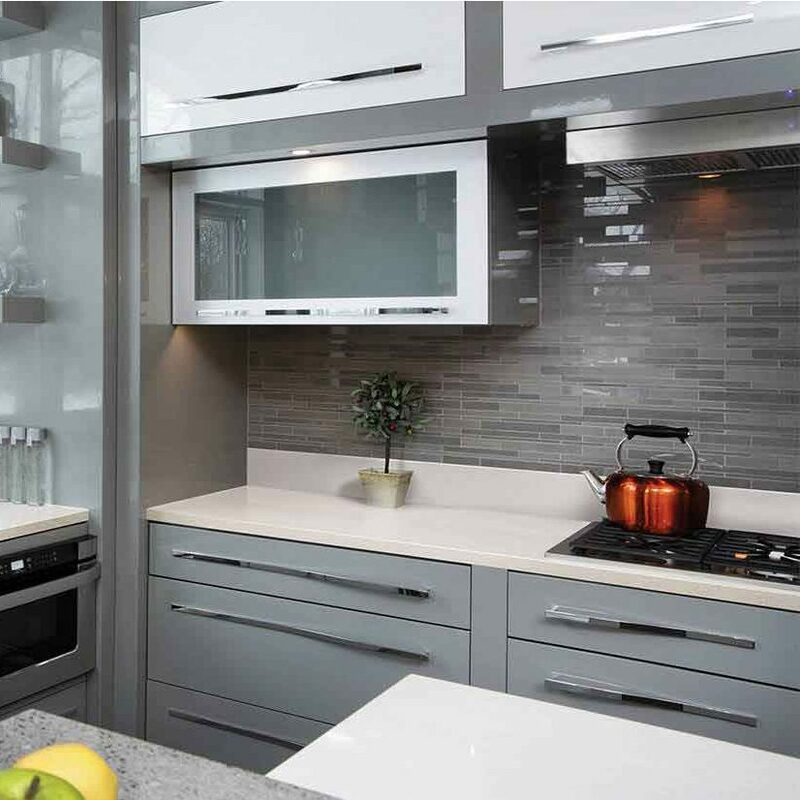 Gray can refine a design, particularly a kitchen where this neutral color plays so well with stainless steel appliances. In this contemporary kitchen, the use of a gray interlocking backsplash and coordinating cabinetry is the perfect complement to our Frost White quartz countertop. From a distance, the eye is drawn to the intricate detail of the backsplash, but close up, the subtle flecks in the countertop unify the space with ease. Let’s talk bathrooms! 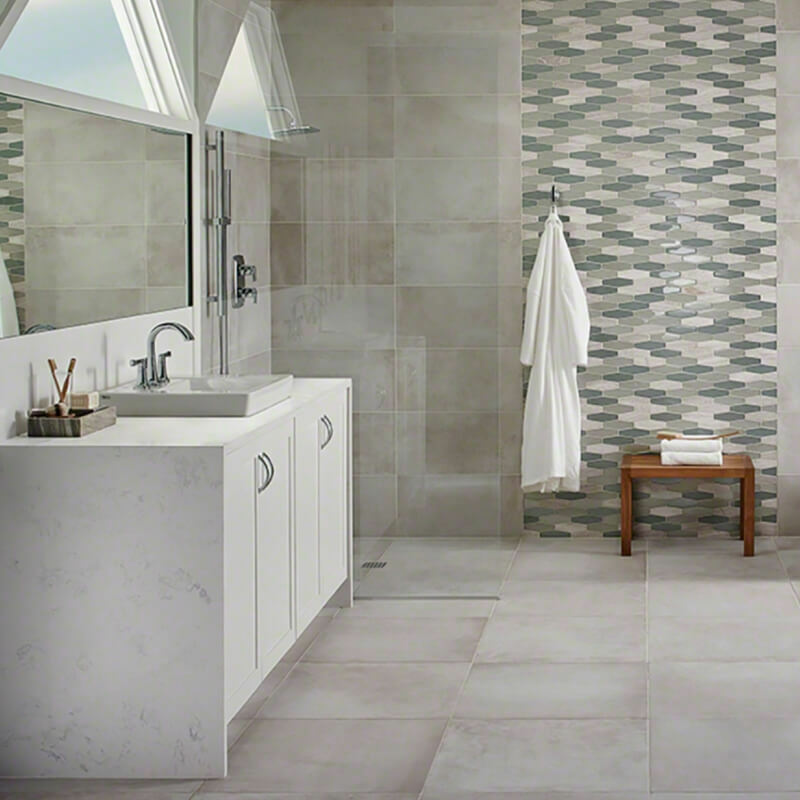 Much like kitchens, bathrooms rely on a combination of textures, colors, and patterns to create appeal. In this retreat, the view of the green rolling hills is the star. All of the other elements were carefully chosen to complement, not fight with the view. The texture of the stacked stone backsplash and the richly toned vanity successfully brings the outdoors, inside and lends a warmth to the room. The Calico White quartz countertop echoes the simplicity of the flooring and the beautiful freestanding bathtub perfectly. If you have a waterfall island in your kitchen, you know how easy it is to clean, and how great it looks. 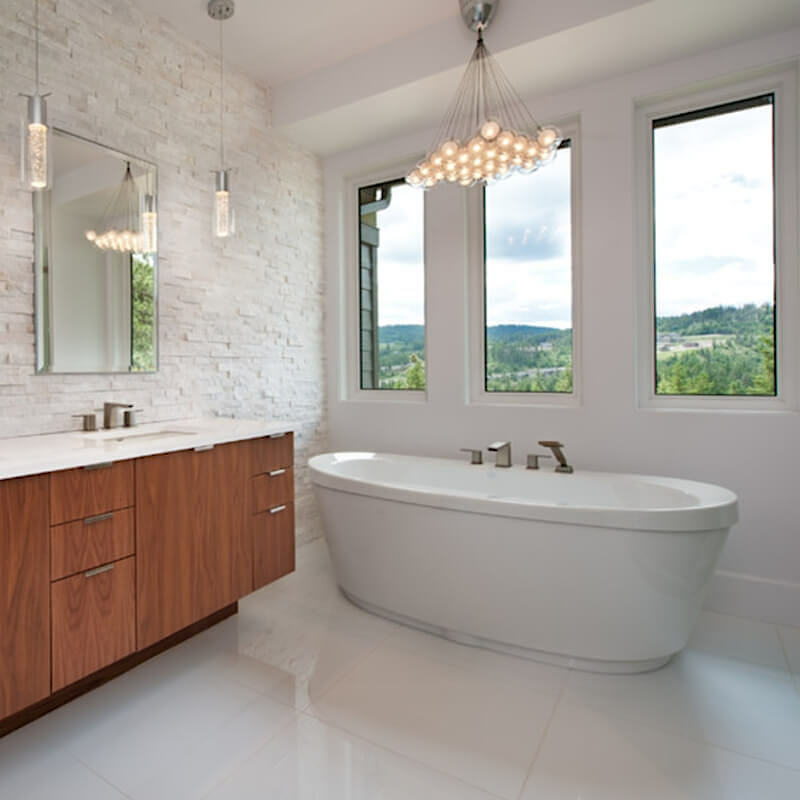 Take a look at this ingenious use of our Calacatta Vicenza quartz in the bathroom! A classic vanity is transformed into a breathtaking piece with the quartz running down the sides. In a moist environment, this is a great way to keep cabinetry from warping or needing a coat of paint every few years. White kitchens and bathrooms will always be a homebuyer’s dream. 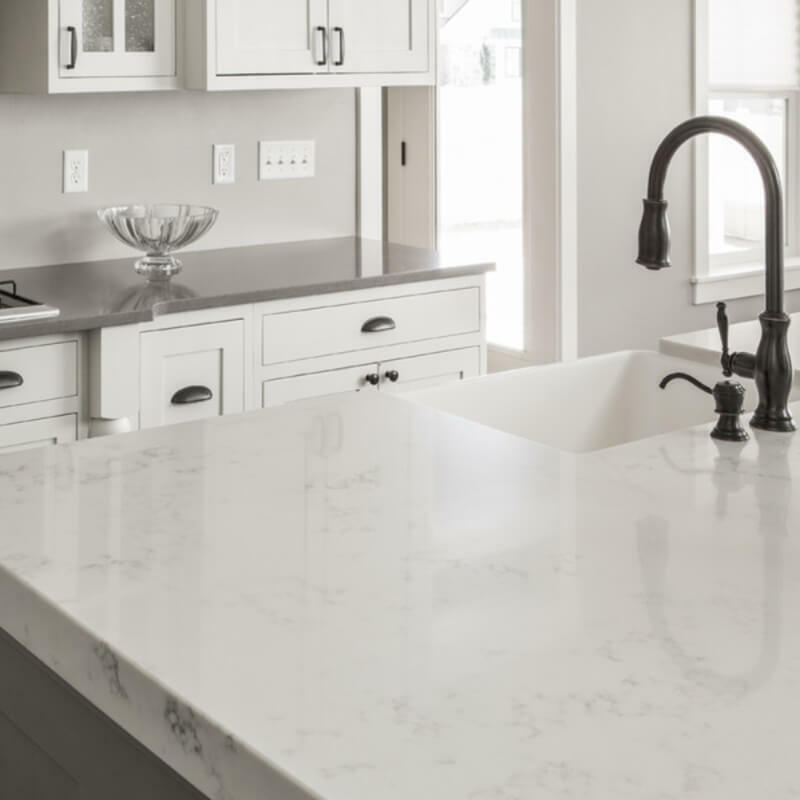 Natural stone is an excellent option for some homes, but for people who long for durable and easy to care for surfaces, Q Premium Quartz™ may be a better option. Quartz never needs sealing, quartz doesn’t harbor germs, and it is easy to keep clean. 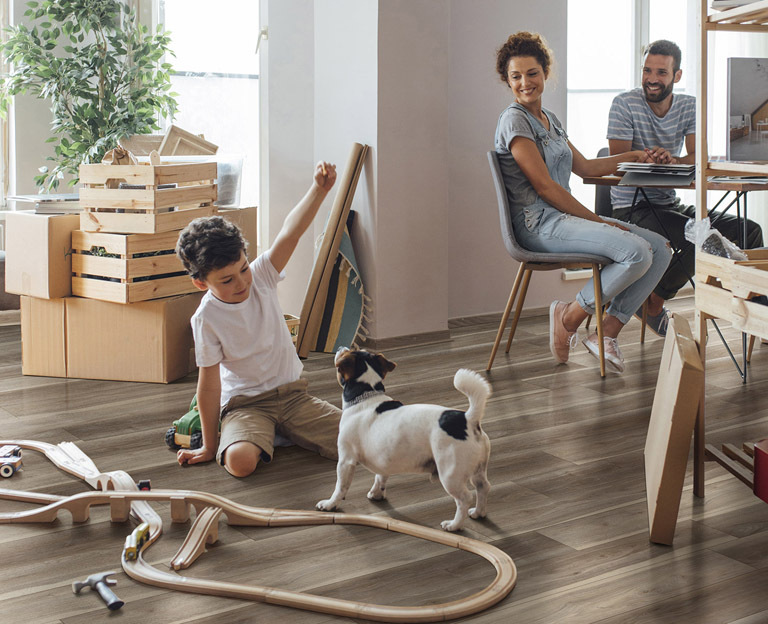 If it has been a while since you’ve looked at quartz, browse through our collection to see the new exquisite patterns and colors of quartz available today.